November 29, 2018 — For the scores of migratory and nesting bird species in Connecticut to survive and thrive, the state’s cities and suburbs must create, maintain, and improve their local habitats in everything from small neighborhood parks to larger nature preserves. A PDF of the report is here. Connecticut State of the Birds drew the attention of media statewide. Click here for links. Titled “In Cities and Suburbs: A Fresh Look at How Birds Are Surviving in Connecticut,” the report shows how the most heavily-developed areas are crucial to the survival of the state’s and the region’s birds. Some of the most vulnerable species nest in Connecticut’s cities, and research shows that city parks are more important to migrating birds than previously known. This is the 13th annual version of Connecticut State of the Birds. Flocks of shorebirds are common sights near the state’s cities. Photo by Julian Hough. 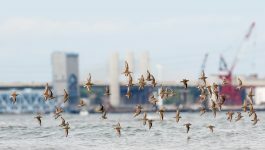 “The health of birds and of the natural areas they use is linked to the ecological health of the state’s cities and suburbs,” said Patrick Comins, Connecticut Audubon’s executive director. “Because of this juxtaposition of wildlife and humans, Connecticut has the highest percentage of areas where high quality wildlife habitat is intermixed with developed areas in the U.S.
Cities are essential to Peregrine Falcons, which nest on buildings and bridges. Photo by Paul Fusco. The report recommends several ways to protect habitats locally, including passing the federal Recovering America’s Wildlife Act to redirect federal funds to the states for conservation planning and implementation; expanding a U.S. Fish and Wildlife Service Program in which local partners maintain designated habitat areas in cities; and increasing the use of Motus Wildlife Tracking System to help researchers follow when and where migratory birds travel. The report includes articles by researcher and Pulitzer-nominated author Scott Weidensaul; Robert Klee, the commissioner of the Connecticut Department of Energy and Environmental Protection; Chad Seewagen, executive director of the Great Hollow Nature Preserve in New Fairfield; Chelsi Burns and Shaun Roche of the U.S. Fish and Wildlife Service; and Laura Saucier of the Connecticut DEEP. A center-spread map demonstrates the importance of urban areas by showing nine of the state’s largest cities and nine birds of conservation concern that nest within their borders. The map was created by Julian Hough using data from the first year of the Connecticut Bird Atlas project (the subject of last year’s State of the Birds report); Hough and Paul Fusco designed the report, which was edited by Connecticut Audubon staff. 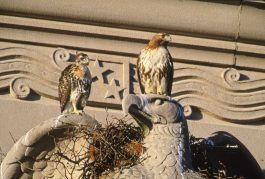 Raptors like these Red-tailed Hawks nest in Connecticut’s cities. Photo by Paul Fusco. Connecticut’s city birds: not just pigeons. Birds of conservation concern live in several of the state’s largest cities, the report shows. Peregrine Falcons, for example, emerged from near-extinction and now nest in Waterbury and regularly perch in the old Union Station clock tower there, and on bridges in and around New London. Yellow-crowned Night Herons nest in neighborhood trees and haunt the marshes of Stamford, Norwalk, Bridgeport, and New Haven. Great Horned Owls can be seen or heard in Hartford, Groton, Waterbury, New Haven, and Stamford. And Bald Eagles continue to astonish residents of New Haven, Norwich, Norwalk, and Hartford. City parks: more than bird stopovers. It’s long been known that migrating birds use city parks to rest and feed. But that’s not because these sometimes noisy or contaminated green spaces are ideal bird habitat. Rather, writes report author Chad Seewagen, parks and similar spots are often the only places for birds to find food and rest in a sea of blacktop. In his research, Seewagen documented that city stopover sites can be high quality bird habitat when it comes to one key measure—feeding. Seewagen measured the rate at which birds gain body mass during their stay in two particular locations, the Bronx Zoo and Prospect Park in Brooklyn. He found that birds refueling there put on fat at the same rate as their counterparts outside the city. Research in other cities showed the same. For Connecticut, this means there is the potential for migrating birds to find what they need right in the middle of metropolitan areas. Connecticut’s urban bird successes. One way the report recommends cities can help birds is by creating green spaces designed for birds, butterflies, native plants, and people. Chelsi Burns and Shaun Roche of the U.S. Fish and Wildlife Service write that New Haven, for example, boasts more than two dozen such places ranging from parks totalling hundreds of acres to modestly-sized schoolyards. Hartford and Waterbury are prime locations for similar efforts, the report recommends, as are coastal areas in eastern Connecticut. New technology shows that birds are closer to us than we probably thought. What we know about birds in cities is increasing due in part to the Motus Wildlife Tracking System, which combines miniaturized radio transmitters known as nanotags with a network of receivers. An article by Pulitzer-nominated author Scott Weidensaul describes how researchers are using this technology to gain more information and greater insight into bird migration. Based in Fairfield, Connecticut Audubon Society is the state’s original and independent Audubon society. It has seven centers and 20 sanctuaries covering more than 3,000 acres; an EcoTravel program in Essex; and an award-winning outdoor conservation education program, Science in Nature. 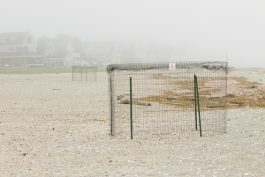 Piping Plovers on urban beaches often need wire exclosures to keep predators away. Photo by Paul Fusco.